Tre Pesci is located on one of the most stunning 10.5-acre properties in Montecito/Santa Barbara. Situated at about 1100 feet above sea level on a completely private knoll, it features spectacular 360° views of the Pacific, the mountains, Montecito, Santa Barbara and Toro Canyon. Enter through a private security gate and follow the 1200 foot long private drive to a large circular parking area and immediately gain access to another world. Tropical Bamboos and Palm trees mixed with local Pines and Jacarandas, and an exotic array of desert species transport you to Bali for one moment and to Southern France the next. A huge lawn provides an ideal playground for children. There are also a boule (bocce) court, a huge koi pond with a Balinese teahouse and a solar-heated 30x20 pool away from the house. Next to the "lion-king " outlook a 6-person Jacuzzi floats on the cliff with stunning 180° view of the ocean. A lower terrace, with a dining table for 16 and a full outdoor cooking and BBQ facility, provides amazing vistas of Toro Canyon and the pacific — a spectacular spot to entertain late into the night. 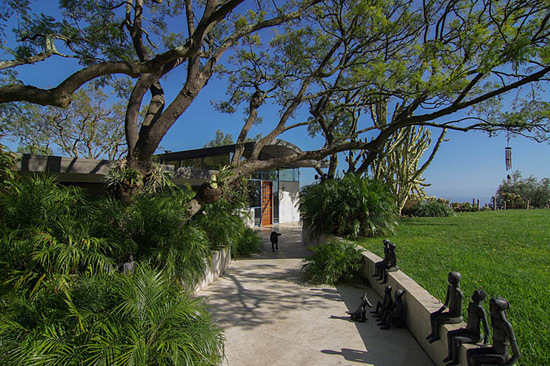 The ultra-modern steel and glass house, originally built by famous furniture designer and architect Paul Tuttle, was completely re-designed in early 2000 by Santa Barbara architects Ferguson/Ettinger. The house, built around an all-glass atrium with a huge tree and koi pond inside, connects to the surrounding nature through dozens of large glass sliding doors in all directions and features 3 comfortable bedrooms, 3.5 bathrooms, a dressing room, a media-room and a fully equipped work-out studio/playroom with a tournament size pool table and a Yamaha piano. "...like many of us who stumbled upon Santa Barbara 's splendor on a weekend getaway, the [owners], who lived in Los Angeles at the time, saw a real estate sign as they wound through Toro Canyon. Ten days later, they were transplants. That was 13 years ago before three phases of renovations. "We instantly fell in love with the property," remembers [the owner]. "But the existing house was completely square with no views, with an atrium inside but none of the rooms were connected. We called it a 'square doughnut.'" Even though the house was determined to be a teardown, the owner (also a trained architect) and his hired design team felt a deep respect for the house's original master, Paul Tuttle — a mid-century architectural icon and Santa Barbara resident. "We were privileged to work on his design and were very respectful of his intent," says the architect, who invited Tuttle to his studio for his comments on the study model of the new concept. "He enthusiastically endorsed it—and us." So rather than copy or mimic his design, the team deliberately departed from it, to create "a clear dialogue between the new and original." He adds, "The owners seemed to have found kindred creative souls in the architects, and the foursome embarked on a 'desire to break out of the box,' opening up the otherwise introverted home to the breathtaking views of the Channel Islands and canyon below. Extensive structural renovations ensued — the soaring 'flying carpet' roof that embraces the sky and landscape, the complementary curved entryways to the loggia and bi-level deck, the glass-walled atrium that now had encircling interior walkways that connected all the rooms in the house, and additional landscaping by a famous landscape architect, who planted tropical trees mixed with Japanese bamboo and succulents throughout the 10-acre property..."
There are currently no specials for this property. "...contemporary Italian leather furniture and European paintings and sculptures by revered artist Gabriele Schnitzenbaumer mix with oversized vintage textile pillows and sheepskin rugs in the living room, while floor-to-ceiling mystical flying bird wallpaper pairs with a museum-quality Gerrit Rietveld chair in the master bedroom. Not to forget the open kitchen with its 360-degree views, where the owner spends most of her time entertaining and preparing elaborate meals..."
"...the mini-retreat is a paradise for kids and guests who often trek the hillside digging for unearthed crystals, picking oranges, swimming in the lagoon-like pool, dancing in Moroccan tents and a starlit repose on a remarkable slab of rock jutting over the canyon. "We literally live in the wild — everything in nature you could possibly imagine is here," says the owner — who admits to constantly changing things and feeling the house and grounds "are transforming and never finished" — chimes in with his love of the climate and Riviera-like environment..."
and may not be downloaded, republished or reproduced in any way without written permission.